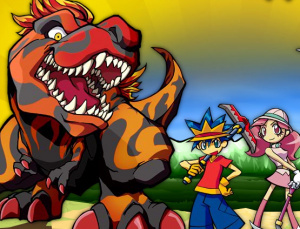 Nintendo will launch their newest DS title today in North American with the release of Fossil Fighters. Not only do you get to search for and dig up tons of fossils, but you also get to clean them and revive them for use in battle. Your vivosaur's strength depends on how well you clean the fossil, not to mention how many of the various body parts you're able to locate for each species. You can check out the official press release below for more information on the game and remember it hits store shelves in North America today! Dinosaurs may be long gone from the earth, but for owners of the portable Nintendo DS™ and Nintendo DSi™ systems, a new breed of prehistoric excitement is just now coming to life. With today's release of the Fossil Fighters™ video game, Nintendo is delivering a dino-sized gaming experience that fans of any age or background can pick up and enjoy. "Dinosaurs are a source of endless fascination for the young and the young at heart," said Cammie Dunaway, Nintendo of America's executive vice president of Sales & Marketing. "Combining customization and social play, Fossil Fighters brings together the best elements of hand-held gaming for players of all ages." Using the Nintendo DS stylus and touch screen, players can chip and drill away at each fossil they find. They can even blow into the Nintendo DS microphone to clear away dust. Once a fossil head is cleaned, the Vivosaur can be revived and used in battle. Other fossilized body parts can also be found and cleaned to imbue each Vivosaur with special powers. Players can create custom teams of three Vivosaurs, strategically selecting the best trio for each encounter. For more information about Fossil Fighters, visit www.FossilFighters.com. We'll have a full review of Fossil Fighters soon. Until then you can check out the official gameplay trailer and screenshots below for a taste of what you can expect. This looks very much like Sega's Dinosaur King. This game is surprisingly good just from the little bit I've played it. I know, we just got our review copy yesterday. Now I've got to review Rock 'n' Roll Climber before I can even get to Fossil Fighters later this week. REVIEW TIME! i can't even get this game though cuz i just got a game last month . Corbie will you be reviewing mario and luigi bowser's inside story? I love fossil fighters! i hope it makes it big!! This game looks like a must-buy for me! @Egg miester at least with this game you can get Nintendo Coins. I thought this was a Sega game at first, but Damo's just cleared that for me. The games are very similar and this one looks good, so I'm not sure whether to wait or go for Dinosaur King. Probably wait. From that picture, I can't tell if the boy is wearing a hat or just has really crazy hair. It actually looks more like a Spectrobes rip-off to me. I'll just wait for Corbie's review before I completely write this one off. Not for me. That's not to say it won't be good, however. That's exactly what I said before I played it. And you guys know how much I hate Pokemon. This looks pretty neat, especially since it combines what resembles a Pokemon-styled experience with my passion for anything prehistoric (including good ol' NES lol )! Definitely a good purchase for me if and when it hits our shores! And if it doesn't there's always Play-Asia.com! Well, I have only put a couple of hours into this but I am very impressed with it. There is a lot of polish to this game and it is rather addictive so far. Well I've got my copy, so I'm taken care of. Nintendo is fed up with Pokemon copies, so they copy it themselves. Is it really a "ripoff" if the same company made that game too? I've been looking forward to this game for a while so im excited. "Is it really a "ripoff" if the same company made that game too?" Just because Nintendo published it doesn't mean they "made" it. Game Freak "made" Pokemon. And there is such a thing as self-plagiarism, you know. Guys! i just got it and it is Awesome! and very addicting, because you always look foward to the nex dig site you unlock to see what fossils you'll find. I am already a level 4 fighter, and it cleaning is fun too, you should really check it out!